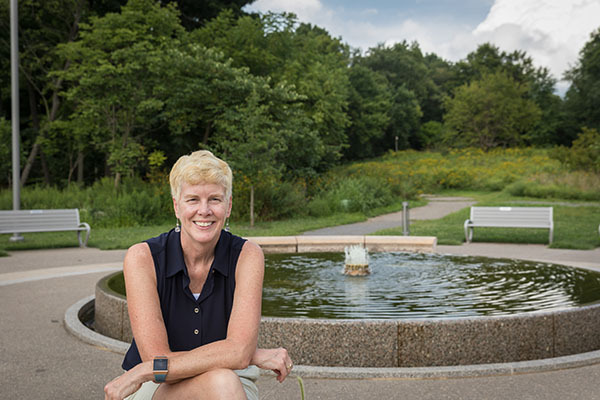 Jayne Miller, president and CEO of Pittsburgh Parks Conservancy, grew up on the southern end of the Adirondack Mountains. That’s where her love of the outdoors began, and what makes her an advocate for better Pittsburgh parks now. “I think all of us have those stories,” she says. Slowly, people in the audience start to reopen their eyes, and Miller bets that most of their memories were set in a green space or a park. Miller, who grew up just outside of Lake George, New York, on the southern end of the Adirondack Mountains, is making a point. Research shows that parks are integral to a city’s success. She and her eight siblings spent summers on Lake George swimming, camping and boating. They built a rope tow in their backyard in the winter for skiing and sledding. She remembers her father, who was a veterinarian at an animal hospital next to her family’s house, flooding out their front yard every winter to build a makeshift ice skating rink, and constructing a backstop in her backyard for summer baseball. “We were the neighborhood yard where everybody came to play,” she says with a smile. But despite the joy of her youth, there was some significant loss as well. Her parents divorced when she was a child, and her father remarried when she was 10. Just one year later, her father was killed in a car accident. When she was 18, her stepmother also died in a car accident. She was able to heal some of her trauma, she says, by simply growing up in such a majestic part of the country. “My dad did an amazing job connecting us to the outdoors and ensuring that we did lots of different activities,” she says. Spending time with her dad in green spaces, she says, is a big piece of her connection to nature, and one reason she’s made it her life’s work. Miller says the goal of the Listening Tour is twofold. Firstly, it’s to share data that both the PPC and the City, in a partnership that began in 2009, have collected about the parks in Pittsburgh and the communities around them. Data includes statistics on environmental conditions, crime and vacancy rates, and economic health. Secondly, it’s to collect feedback on what Pittsburghers want to prioritize in their parks via resident surveys. Feedback from the surveys will help the City and PPC identify park sites that need the most investment. Miller is a firm believer that parks are, and always need to be, public spaces. She iterates that the City of Pittsburgh and the PPC are simply stewards of this public space. Despite her organization’s professional expertise, she says, the citizens of Pittsburgh are the ones driving the decisions the PPC makes. The PPC and the City of Pittsburgh have calculated a $400 million capital backlog across the city parks system. 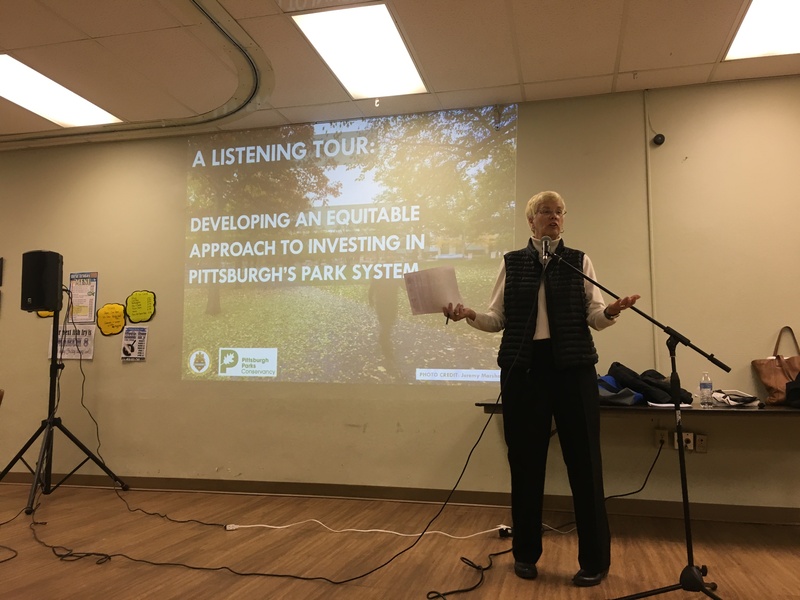 Miller is hoping to solve the challenges Pittsburgh’s park system presents by using a similar nuanced approach to problem solving that she did in Minneapolis. Miller explained that while the build out of parks in both Minneapolis and Pittsburgh happened around the same time—the late 1800s—the way they were designed was completely different. In Minneapolis, a landscape architect was hired to create a blueprint for the parks system, which the city was then built around, making the parks and the city uniquely interconnected. Pittsburgh parks, on the other hand, were built individually. “We have some very iconic parks here, but there’s a lot of disconnects,” Miller says. The hilly topography and the highways, for example, present challenges. People at the Listening Tour at Riverview United have other gripes, too. A few people mention the overpopulation of deer: According to Mike Gable, Director of Pittsburgh Public Works, who is present at the meeting, the park’s deer population has risen from about 10 deer per square mile in 2010 to about 80 per square mile at present. Others bring up the problem of off-leash dogs and poor trail maintenance. While the PPC hasn’t looked at the data park by park yet, Miller says that tree canopy, or tree care maintenance and investment in more trees, has come up as a high priority city-wide. “I’m an active cyclist, and I will choose riding in a park or along a street that’s got a great tree canopy over anything else because I know how I feel when I’m in that kind of space,” says Miller. The PPC’s goal, along with the City’s, is for every Pittsburgher to live within a 10-minute walk to a park. It may be lofty, but it’s one that Miller and her team are ready to push toward. Once the Listening Tour is complete, and feedback is collected from residents, the PPC will write up a master plan for park investments, which is expected to be done by May. 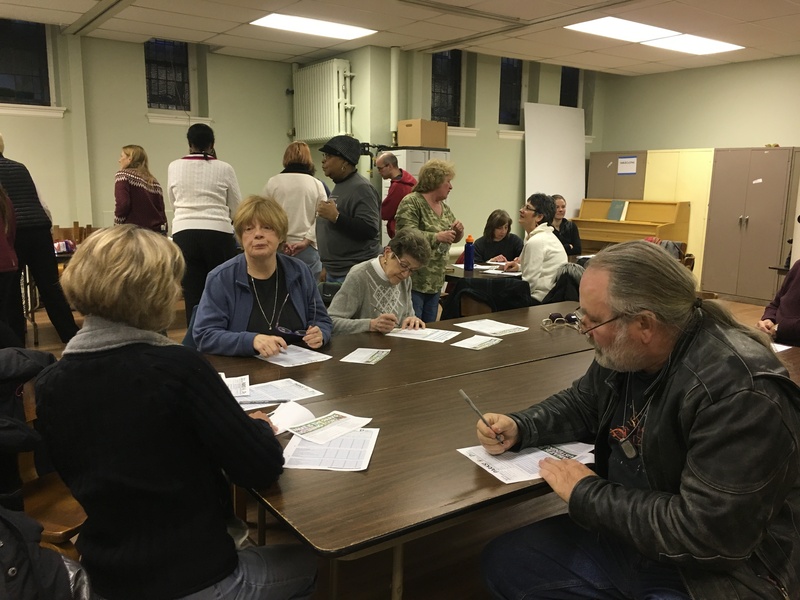 The final Northside stop for the PPC Listening Tour is on Wednesday, April 10, at 6 p.m., at the Most Holy Name of Jesus Parish, located at 1700 Harpster Street in Troy Hill. If you’re a Pittsburgh resident and unable to attend this or another tour date, you can watch the full tour presentation slideshow and fill out an online survey on the PPC website at www.pittsburghparks.org.